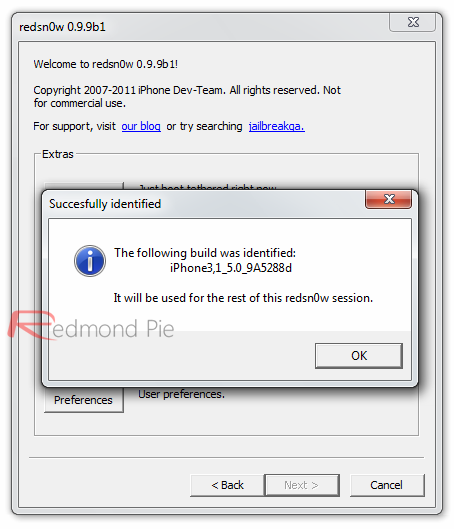 Redsn0w, the prominent jailbreaking tool developed by veteran of the scene MuscleNerd, has today been updated to version 0.9.9b1 and brings with it some key improvements, rendering it one of the most significant updates to date. Whilst Redsn0w has done a terrific job of enabling the jailbreak of any iOS device bar the iPad 2, the process is somewhat elongated by the necessity of downloading the entire .iPSW file specific to the device in order to carry it out. The joy of using the likes of Comex’s JailbreakMe or the Chronic Dev Team’s Greenpois0n tool is that one doesn’t have to download those bulky (600mb+) files in order to quickly free the iPhone or iPod touch of that metaphorical ball and chain. MuscleNerd has addressed this issue with the very latest update, released just minutes ago. Redsn0w detects and automatically downloads the essential files from Apple’s servers required to perform the jailbreak. Additionally, it stores those files in its cache, preventing the need to re-download for the purpose of carrying out the jailbreak again in the future. The system works for both tethered and untethered jailbreaks depending on the progress that has been made with said version of iOS. Please note that the ‘scan and store’ of the essential files does NOT apply to the iOS 5 Beta releases. Those wishing to jailbreak one of the several incarnations of iOS 5 Beta will need to go about it the old school way and provide the full .iPSW in order for it to work. This limitation is placed because iOS 5 Betas are not available to public. stitching is NOT yet supported on iPhones (well, at least not tested). Need to work out the baseband part of the restore process. Step 1: Download the new Redsn0w 0.9.9b1 for Windows (direct link) or Mac (direct link). Step 2: In order to just jailbreak your iOS device, simply click on “Jailbreak” button and follow the standard onscreen instructions to enter DFU mode in order to install Cydia on your device. If you are not using any Beta firmware (like iOS 5), Redsn0w 0.9.9 will automatically fetch all the important bits from the required firmware files without bothering you to download those large IPSW files. 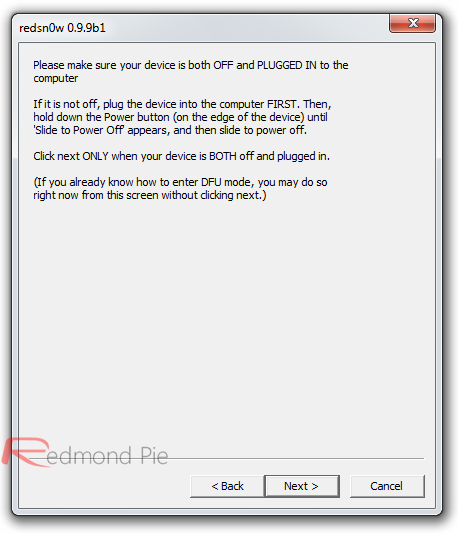 If you are using iOS 5 Beta firmware, you will need to provide the .IPSW firmware file manually. Step 3: That’s it! You are done with the jailbreak. Optionally, you can use extra features found under “Extras” option. This includes options such as entering DFU mode, booting in tethered mode (required by all tethered jailbreaks: iOS 4.3.5, 4.3.4, iOS 5), fetching, verifying or using SHSH blobs, changing boot logos and more. With the end-user release of iOS 5 just around the corner, it would be nice to see a swift update enabling the time and bandwidth saving technique to be applied to the latest firmware. Would be even nicer if we saw an early untethered though, wouldn’t it? Would almost be like Christmas coming early – new iPhone, new firmware and fully untethered jailbreak! Things don’t tend to run that smoothly in the cat and mouse world that pitches the Cupertino company up against the jailbreaking community; But hey, we can hope!